Provide comfort for the family of Alain Mercado with a meaningful gesture of sympathy. 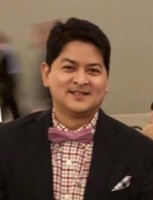 Alain Mercado passed away on January 4, 2019. He lived in Pampanga, Philippines before calling Winnipeg home. Alain is survived by his wife, Ria Hill Reyes, children, Raven – eleven years old, Arianna – eight years old, Aisha - six years old, and Athena - three years old, parents Angel and Carolina, siblings Dorette ( Raffy), Karen( Derrick), Claire (Remar ) and Aries family and friends in Winnipeg and all over the world. Alain was a loving father, dedicated to his wife, and a hard working “bestie” to his co-workers. Alain gave all his best to be a good son, sibling, husband, father, friend and colleague. His good natured temperament was the tune where Ria’s love, and the children’s cacophony of boisterous noise and angelic voices filled their wonderful home. Alain’s hard work was the back bone of his children’s future. Alain’s true love was for only Ria’s heart to please. Alain’s wife and family would like to extend their gratitude who have given support and compassion during this difficult moment. It is your kind words and gestures that has given us strength as we try to move forward. Lamay/Viewing will be held at Mosaic Funeral Chapel, 1839 Inkster Blvd., Winnipeg, MB. on Friday, January 11, 2019. Lamay will commence at 6:00 p.m. Vigil Prayers at 7:00 p.m. Rev. Father Dominic Yuen officiating. Mass of the Resurrection will be celebrated on Saturday, January 12, 2019 at 10:00 a.m. from St. Anthony Padua Church250 Burrin Ave., with Rev. Father Dominic Yuen presiding. To send flowers in memory of Alain Mercado, please visit our Heartfelt Sympathies Store. We encourage you to share your most beloved memories of Alain here, so that the family and other loved ones can always see it. You can upload cherished photographs, or share your favorite stories, and can even comment on those shared by others.